I like that Jody Hedlund used a strong female protagonist to set the stage for a story about women who make a difference. 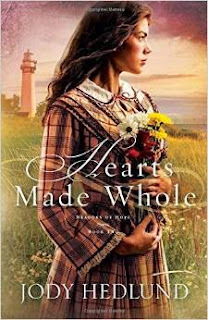 There's no doubt that Caroline can do the job of lighthouse keeper, yet she shows her sensitive, caring side to the wounded soldier who is placed in the job she loves. I loved Caroline's two little brothers. They added a sense of playfulness to a serious situation. I enjoyed the twists, turns, and surprises of this well-written tale of courage. If you like historical fiction with romance, you'll love Hearts Made Whole.